T-L Photo/RICK THORP Barnesville’s Regan Hanlon prepares to deliver during Game 1 vs. St. John on Saturday at Amanda’s Field. Hanlon fired a three-hitter and drove in the game-winning run in the Shamrocks’ 4-2 triumph. BELLAIRE — Barnesville and St. John staged an old-fashioned pitcher’s duel Saturday afternoon, one that featured a combined 25 strikeouts. The Shamrocks’ Regan Hanlon and the Irish’s Jayden Lowe were both tough nuts to crack but, in the end, Barnesville did just enough to prevail 4-2 in the first of two games at Amanda’s Field. “I knew the girls had this in them,” said Shamrocks head coach Leslie Skinner, who earned her 50th career victory. “They’ve been working and working. 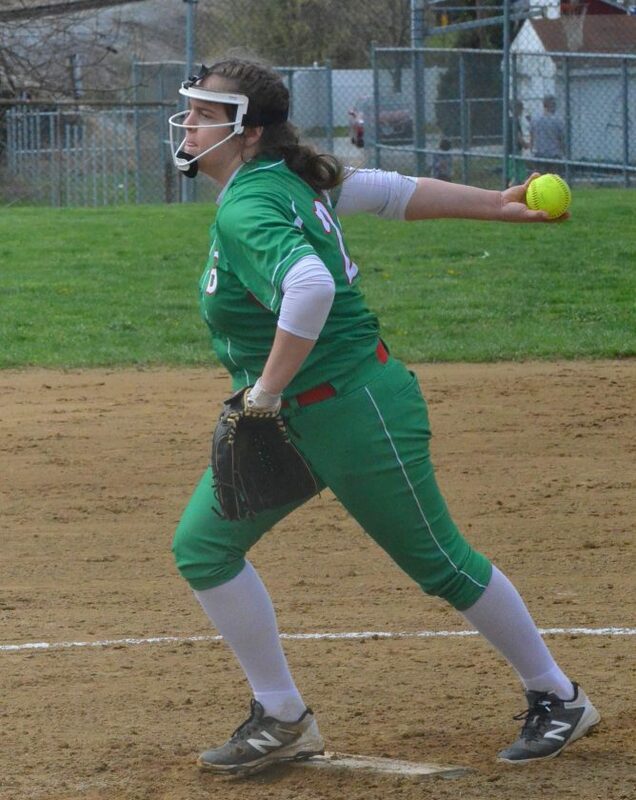 After dropping a pair of close encounters to Monroe Central and River earlier in the week, the Shamrocks got back to .500 (8-8) thanks, in part, to Hanlon, who excelled in the circle and at the dish. The junior went the distance, fanning 10 and walking two in crafting a three-hitter. Her RBI single in the fourth broke a 2-2 tie. “She just continues to get better and better,” Skinner said. “I know she can pitch. She’s gonna have an off day. We all do. As have many of the Shamrocks, according to their coach. That was on display in the second when Barnesville broke the ice with a pair of runs. Madison Detling walked to begin the inning. Bailey Leach then singled to right, as Detling went to third. Lowe, who amassed 15Ks, fanned the next two batters, bringing catcher Jessica Johnson to the plate. She doubled to left, clearing the bases. Hanlon carried a no-hitter into the third where she made her only two mistakes. After striking out the first two batters, Lowe and Shaylyn Horvath belted back-to-back dingers — to center and right, respectively — tying the game. Hanlon settled down after that, though, fanning five of the next six batters, allowing only a leadoff double to Danielle Yaegel in the fifth and a one-out walk to Elizabeth Schnegg in the seventh. The Irish were unable to bring anyone around, however. The Irish (7-5) had to shuffle their lineup due to various circumstances and had some players in positions they don’t normally frequent. Still, Magistro offered no excuses and credited Barnesville for being able to take advantage of its opportunities. Tessa Johnston drove in Leach with an insurance run with no out in the sixth. Lowe recorded three straight strikeouts after that. Barnesville, which entered play a few spots out of fourth in Class 3A, welcomes Buckeye Local on Tuesday.